I guess this will be put down to matching demand but Saturday afternoons always seems pretty busy to me. It wont make much difference to me as I can catch any but with my pass but my wife will now be switching back to the 50 on Saturday trips to town now. When you are on Royal Parade waiting for a bus home at a stop shared by the 15 and the 50, there is not much of a difference between 15 mins and 20 mins. But if you just miss a bus, a 20 min wait isn't too bad but chances are you will see two 50s leave while you wait for a 15 every 30 mins. That will swing it for many passengers who like us have a choice between the two. Just one other thing to note. The VOSA registration gives the start date as 10th December but the timetables start from the 4th December. I assume that the VOSA notice is an error. 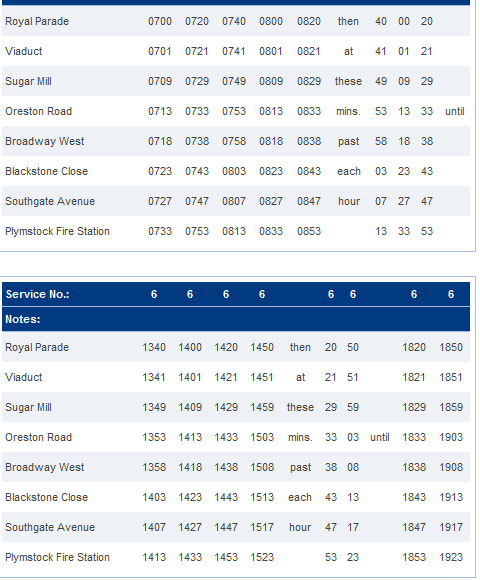 The other service to change on the same date is the X80 which I will look at later. The 5 will change in January, but no times are up yet. Sadly this seems to be the nature of First D&C that they keep adding then chopping and changing their services with little regard for their customers. Because of this I personally do not trust them and would prefer to support Plymouth Citybus, whilst not perfect, seem a lot more of a stable operation. For example Citybus provide a Monday to Saturday evening service with the 5 and 5A whereas First’s 6 and 7 do not. I can only speak as i find..but the 15 seems very busy <Mon to Friday and sat mornings but does go quieter in the saturday PM slots. Maybe First prefer to cut frequencies where services are not used rather than price increases that Citybus seem to favour!! Personally I prefer First to Citybus, the service is much better and the driers on First in the main much more friendly and helpful!! Where I live there are more Citybus services than First on paper...but First run pretty much every 10 mins as per timetable...Citybus are supposed to be every 5 mins but in practice come in runs of 3 or 4 then nothing for 15/20 mins. First are also a lot cheaper!! maybe because thet match services to demand a lot better and so have a lot less empty buses/wasteage than Citybus!!! Wembury for example now has a very poor service compared with only a few years ago. First just kept on cutting until they abandoned the service all together. Devon CC now contracts the service to First but apart from daytime there is now no early morning or evening services. This is the trouble with how First run their buses that many people on their marginal routes have now been severely disadvantaged by their behaviour. Plymouth Citybus, even under GoAhead do seem more customers focused even if this is proving to come at a cost, when compared against First D&C. This Shows a Marked Reduction in First D&C's Customer Conscience! £3.30 for a Dayrider; what Can You Do with It? Well, Even Less Now! It would be nice though if First would use the resources saved on these Saturday afternoon cuts to extend the wekday routes a little later in the evening.... Maybe UGO 6,7 and 15 once a hour leaving town 7pm,8pm and 9pm would be great!! I guess I am fortunate as we have both First and Citybus here...including a rare thing I know but an hourly evening servic..which includes Sundays!!! First fares are on average 40/50p cheaper than Citybus as well!! Anyone know if Citybus fares will go up in December as they normally do ??? 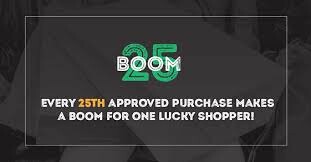 This is another cost cutting exercise by a Company that has been running at a considerable loss for some years and only survives because it belongs to a big group that in effect bails it out. With the financial pressures due to increase next year, (fuel prices, further reductions in concessionary fares rebate, etc) expect more cuts to services and inevitable fares increases. I do miss the UGO 11 and 17 though (Honicknowle and Southway) I guess they were marginal...although how the 11 went from fastest growing route in UK to nothing is anyones guess...I think the axing of the evening service and cutting it from 15 to 20 minutes did it as often they just followed the citybus 61 around!! With regars to Wembury I see your point but I do not see Go ahead rushing to provide a service there either...possibly because there is no money in it!! A bit like Sundays for example where yoiu are lucky to get a Citybus after 6pm!! The trouble is Wembury needs a bus service. Plymouth City Council are always telling people to abandon their cars (and a good thing too) and use public transport to travel into the City. Also there is no park and ride on the Plymstock/Elburton side of the City so how do people from Wembury travel into Plymouth? There are no early morning, evening or Sunday services to Wembury anymore. When First D&C put so much of their resources into trying to somehow bankrupt Plymouth Citybus, then when it all seemingly goes terribly wrong for them what is left (it appears to me at least) is their marginal services in tatters and the people they serve are left without any public transport. I do put the blame for this on First D&C as they were the ones that inherited the routes from Western National. Of course in the past Plymouth Citybus did run the 48 and still run the 49 (Heybrook Bay) under contract for Devon CC. Part of the problem with the rural routes such as 48 and 49 is that residents are in the hands of the local authority, in this case Devon. The authorities have less and less money to spend on supporting rural bus services. Devon has to somehow share this money around all the communities that are not large enough to support a commercial bus service but can demonstrate a social need. 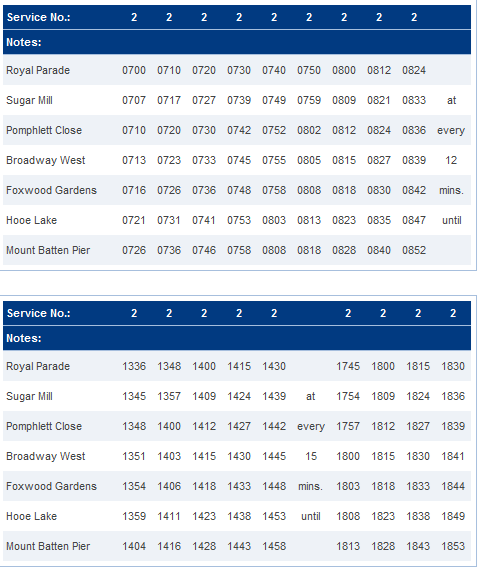 Hence the very limited timetables produced. Look at any similar conurbation in Devon with a tendered bus service and the timetable will be similar. Wembury's answer is growth, the larger the community the more likely a commercial or part commercial service will develop. Housing developments along the road to Wembury might be the catalyst required to jump start a better frequency of service. as a bus driver for first i can honestly say apart from school kids the early morning 48's only carried a handfull of passengers, with quite a large population (for a village) even now during the day you occasionally fill up a dart (seated only) with pensioners whats that 20 - 30?? out of a popultion of 3000 (according to wembury parish website) it is sad but true that BOTH companys are profit driven, so if it don't pay, it don't run!!!! Re Anon 12:35 13/11/11.... As a First driver doi you think thet will cut back even more in Plymouth next year ?? How save is the 15 for example, is it profitable?? Any chance oif any new city services?? I do not believe for 1 minute that First ever had any intention of killing off Citybus...if they had done they wpould have done it years ago when it was council owned... if they had operated rival services on the then council owned citybus routes and had price war, they could have driven citybus out in a matter of months..the council wouldn't have the funding to compete!! I think the now defunct UGO 11,12,13 and 17 were purely a warning to any operator comoing oin not to try and trounce on First teritory...Go Ahead have done nothing to try and oust First out so these services were withdrawn...With the exception of the 15 which does not compete directly with Citybus and is the only service in Mainstone and direct link from Estover to Mutley/Train station etc, so is probably making a nice profit...they seem to choose to axe the 7 (Woolwell) instead!!! I spoke to a First driver a few days ago - he thought that First wouldn't last long in Plymouth and would give it another year or so. It's a fact that they have been running at losses and in my opinion, their only "good" profit making route is Saltash. would they sellto stagecoach or something?? I would say the Tavi buses 83/84/86 and probavbly the 15 is quite profitable ??? ihope First don't go they offer a very good service on routes they run!!! If they do go I hope they sell to the likes Of Stagecoach who would give Citybus/Go ahead a run 4 their money!!! 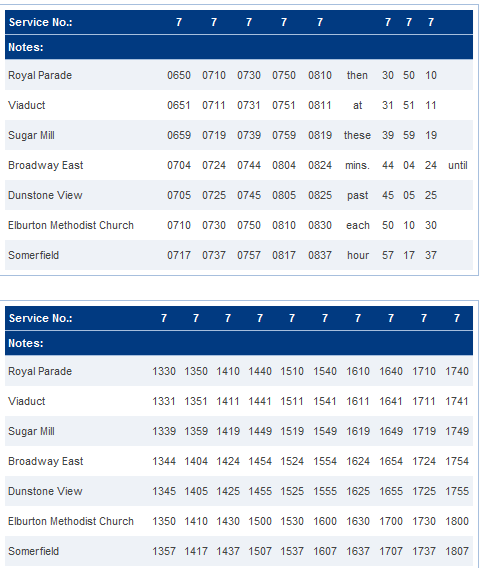 I think everyone needs to take this into context - it is just a few routes reducing frequency on a Saturday afternoon ! First will one day leave Plymouth and the whole of Cornwall. Its not a shame, First is a shoddy operation running old clapped out buses apart from the Park and Ride enviros and Wright bodied B7's. Come on the TaviLynx B6ble's are as old as the hills they drive over every day and certainly wouldn't encourage me out of my car. Go Ahead are part of a PLC as First is and are therefore accountabler to their share holders, but at least Citybus is managed locally with the backing of the PLC. First is now managed from Hants and Dorset by Marc Reddy, he is too far away to have a real grip on Plymouth and COrnwall! Why should he care anyway, as he is climbing higher up the First Ladder with more money. I know it wont happen but I do think it is a shame that the competition commision didn't go for bus route franchising as similar to London, it would cut down on unecessary duplication and with integrated ticketing the bus would become more attractive over night but the Tories wont do that, they prefer to pander to the private motorist. Another note I see Plymouth may get a new airline!!! If the council will save the airport from SHH. Im involved with VIABLE, don't get your hopes up too high yet, we are trying to convince the council the airport is VIABLE as the notice of non-viabiliy hasn't been signed yet, we are not giving up, we can win against SHH and PCC. Personally I hope First do not go... if for no other reason than you would then end up with Citybus/Go Ahead monopoloy in Plymouth. Citybus have already put their farss up twice in the past few months and who knows what they would charge if First were not there to provide competition!! you don't actually know what you're talking about! at the moment first is managed locally from plymouth,by robbie lamerton we are part of first south coast and our MD is not Marc Reddy!! next year we are re-branding so i doubt they'd waste money and then pull out of plymouth! these romours about first pulling out have been going round for years, like a previous poster mentioned first have pulled back to just profitable routes and again look at the bigger picture first operate across devon and cornwall, citybus just in plymouth. Go ahead is not know for being aggressive on routes with other operators and a final note, i think most poster's here are ex drivers with a grudge or disgruntled passengers!!! I believe First never really wanted to keep the routes thet started then axed..it was purely to keep other opertaorsm, namely those who bought Citybus off their routes. In a way it worked...as they put Stagecoach off buying citybus who would have bn very aggresive and instead got Go Ahead who are not all aggresive !!! Anon 20:00 Do you think First will start any new routes in Plymouth...particularly could do with a few more buses along northern corridoe..Derriford/Mutley/City... You say they have retreated to profitable routes does that mean the UGO 15 will remain do you think ??? Anonymous at 21.46 you mention that most of the posters are either ex drivers with a grudge or disgruntled passengers. I assume from your exclamation marks that you are implying that their views have for some reason no merit whatsoever. To clarify I must be a disgruntled passenger then. I can assure you that when you rely on a bus service to get to work then it is completely axed because First deems it to be no longer viable, this has implications for the passenger. I don’t know the true reasons why Plymouth was swamped with an UgoBus network for it to be mostly withdrawn later. I would suggest that some of First D&C’s tactics in the past have been to say the least customer unfriendly. If this has resulted in some routes such as the 48 service being axed and now run as a Devon CC limited tendered service are you surprised that passengers sometimes feel disgruntled? 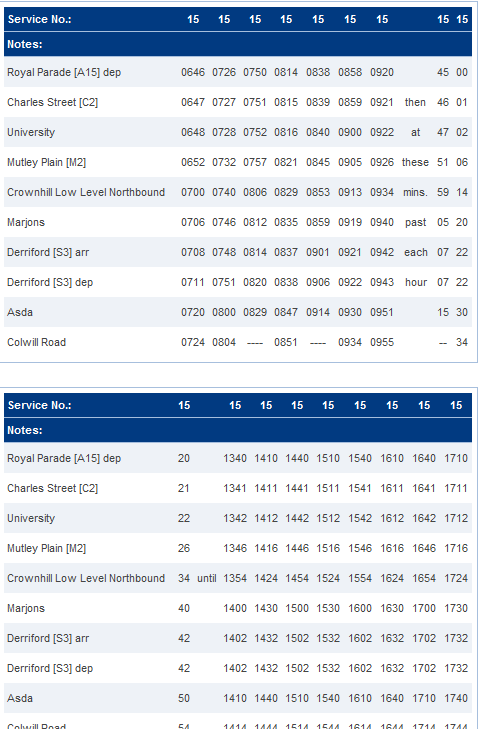 @ anon 20:59 i don't think at the moment there is any chance of any growth on the network, the 15 is doing well because first is working with the uni and marjons giving the students reduced weekly tickets, a few more people are getting on in estover but they hate us in mainstone. I am a passenger not a driver and I certainly don’t think that disgruntled passengers should take their frustrations out on bus drivers. On the whole I have always found the drivers with both First D&C and Plymouth Citybus to be excellent. I promise you I am not just saying that it is true. My grumbling is with First D&C and the way that it is managed. Now I know this is my personal opinion but it was very frustrating to see First D&C trying to duplicate many of the routes being operated by Citybus, whilst at the same time withdrawing services such as the 48 Wembury. There were occasions when it seemed perfectly acceptable to have buses running around Plymouth with 1 or 2 passengers on them, but totally unacceptable for a bus out to Wembury to have 5 passengers on it. First’s management would not communicate with the Wembury bus users, merely citing the concessionary fares reimbursement as being the reason for their frustration and service withdrawal. Whether they mean to or not the First management can sometimes come across as very remote from their users (the passengers) and even dare I say it at times to be somewhat hostile. I do not wish to be offensive to them (I am sure managing First D&C is not an easy job!) but that is the way that they came across (to me at least) at the time.